The social, friendly and talkative parakeet will fill your home with plenty of chatter, but at first he might not. The parakeet will need time to get used to his new environment and the new people in his life. Interacting with your parakeet right from the start, while respecting his need for a little privacy and space, will foster a close and rewarding friendship down the road. A new parakeet in the home definitely needs plenty of R-E-S-P-E-C-T. Encourage interactions when your new budgie is relaxed and awake, and give him his privacy when he is sleeping. Likewise, if he seems nervous or agitated, tone down the interactions until he seems more comfortable. Let your budgie determine the pace of the interactions. Do not push physical interactions until he is accustomed to your hand, or he may become frightened. Pay attention to his body language, and let him guide how far each encounter goes. One of the best ways to interact with a new parakeet is to talk and whistle. Expect your new little guy to be quiet at first; talking softy and whistling to him will help to encourage his naturally affable character to blossom. Get in face time whenever possible by placing his habitat in a social area of the home. Let him hear people talking to one another and to him. When he becomes comfortable enough to start whistling and chattering, mimic his calls and he’ll begin to consider you a member of the flock. Budgies enjoy a gentle touch, but they need to get used to people hands first. Hand-feeding with favorite budgie treats can help yours to become accustomed to you and your hand. Place a treat in the palm of your hand and slowly bring your hand into the budgie’s cage, then wait. Let him approach your hand; if he does not respond at first, just keep trying. Once he realizes that your hand is not a threat and contains tasty treats, a day will come when he finally takes a treat right from your palm. Once he becomes comfortable with your hand, you can begin training him to perch on your finger. 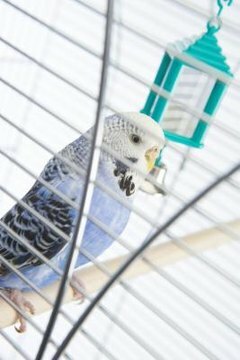 Good Birds Inc.'s Barbara Heidenreich advises that new parakeet pet owners use positive reinforcement with their birds right from the start. Reward good behavior with social interactions, verbal praise and treats; ignore any undesirable behavior. Interacting with your parakeet this way from the beginning will help your budgie to feel secure with you. The more secure he feels the more he will want to interact with you. Positive reinforcement techniques will help him to feel comfortable in his environment, too, which is important for his overall happiness and health.